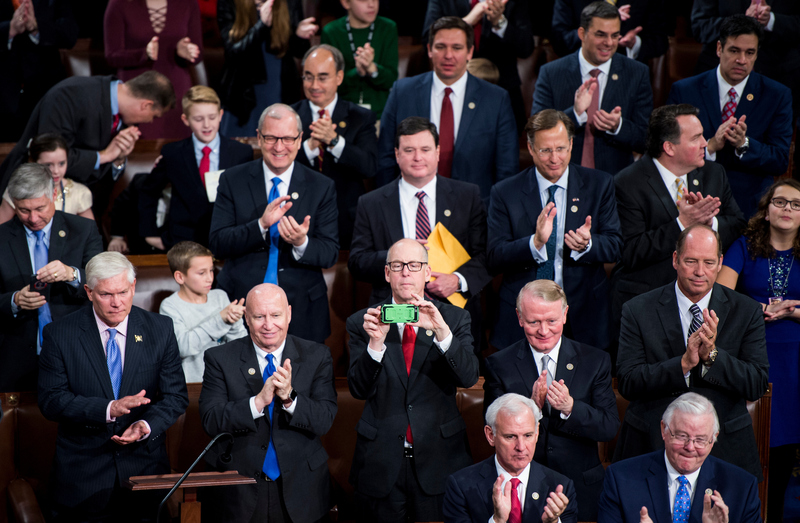 Several Democrats took pictures Tuesday on the House floor as the chamber held a quorum call to kick off the 115th Congress — a violation of House rules that Republicans want to start punishing with a fine of up to $2,500. Roll Call spotted Democrats taking photos in an apparent protest to the proposed fine, which the House adopted later on Tuesday as part of a vote on a package of rules governing operations of the lower chamber. However, the photos were snapped during the brief period at the start of a new Congress when the House has no rules in effect so technically, the Democrats did nothing wrong. A few Republicans, like Oregon Rep. Greg Walden, were also seen taking advantage of the brief rules lapse and capturing photos of the opening-day floor proceedings. Since lawmakers had not yet adopted the new package, members could not be fined for their actions. Taking photos or recording video on the House floor has been a longstanding violation of House rules, but the fine is something new that Republicans are proposing this year as a delayed reaction to the Democrats’ June sit-in on the House floor to protest inaction on gun violence. During the sit-in, Democrats used their cell phones to record video of their speeches and chants, and took photos of themselves and their colleagues after Republicans turned off the House cameras that provide live floor footage to C-SPAN. Some of the Democrats who took protest photos Tuesday shared them on social media. Rep. Jackie Speier of California tweeted a photo of mostly empty chairs on the Republican side of the aisle, saying, “@HouseGOP in disarray not on the floor for quorum call!” At the time she took the photo, House Republicans were meeting in the basement of the Capitol, voting to strip an unpopular change to the Office of Congressional Ethics from the rules package. New Jersey Rep. Bonnie Watson Coleman tweeted a photo of her “special guest” for the swearing-in, and New York Rep. José E. Serrano tweeted a photo of himself with freshman Reps. Darren Soto of Florida and Adriano Espaillat of New York, waiting for the swearing-in ceremony.